Long seed and tube bead earrings with silver plated or stainless steel earring hooks. It measures approximately 4 1/2" long by 5/8' wide at widest. Navajo hand crafted by Douglas Yazzie. 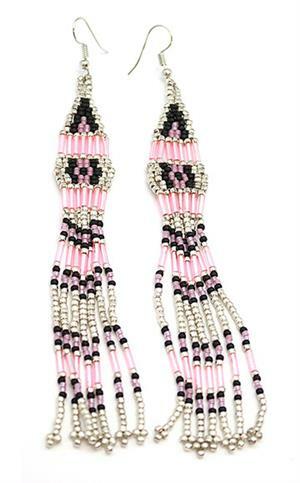 Pattern style and number of dangles will vary. None available like pictured. ***Only available in turquoise/blue/white and red/green/white. *** Choose color when ordering.